The cold would be fatal for an exotic tropical reptile, but Westbrook is still fond of its adopted serpent, which now has a display in a cryptozoology museum. The large snake spotted this summer in and around the Presumpscot River in Westbrook is likely dead by now, done in by the cold that arrived in the late fall and early winter. But the legend of Wessie lives on. The hype began in June, when a resident made the first report of a 10-foot-long snake in Riverbank Park. Westbrook police officers said they spotted the snake swimming in the river and eating what appeared to have been a beaver. Then, in August, a resident walking near the bank of the river found a shed snakeskin later identified as the product of an 8- or 9-foot green anaconda, a native of tropical South America and one of the largest snakes in the world. No one could confirm the skin came from the same snake, and the find led some to speculate that the skin was placed near the river as a hoax. The snake sightings captivated locals and led to the creation of social media pages on behalf of Wessie. The discovery of the anaconda skin elevated the legend and attracted national media attention, as well as Wessie fans who came to scour the park. But as the temperatures dropped, the trail went cold. “We have had no further sightings,” said Westbrook Police Chief Janine Roberts. Interested residents still ask Roberts about the snake, but the chief would not voice any theories about its whereabouts or origins. The lack of any additional sightings doesn’t surprise snake experts. They predicted as much. “The snake probably didn’t make it past October,” said Derek Yorks, a biologist at the Maine Department of Inland Fisheries & Wildlife. That’s because a snake as large as the one reported by witnesses would not be native to Maine, Yorks said. Reptiles are coldblooded, which means they cannot control their own body temperature. Maine’s biggest native snakes include the endangered black racer, which can grow up to 5 feet long. Reptiles that survive Maine’s cold winters typically bury themselves underneath the frozen ground until spring. Yorks said Wessie is probably a boa – a family of snakes that includes anacondas – or a python. Although such snakes are not permitted as pets in Maine, it is possible to buy them in other states. Those snakes are among the largest in the world, and as they get bigger, their owners might release them because they become more difficult to manage. However, a warm-weather snake raised in captivity will not survive long beyond summer. When temperatures dropped, Wessie likely tried to seek shelter in an animal burrow or under a fallen tree. The snake’s remains are not likely to be found, and unless an owner comes forward to explain the snake’s release or escape, the mystery might never be solved. Yorks said not everyone will be convinced of the science. 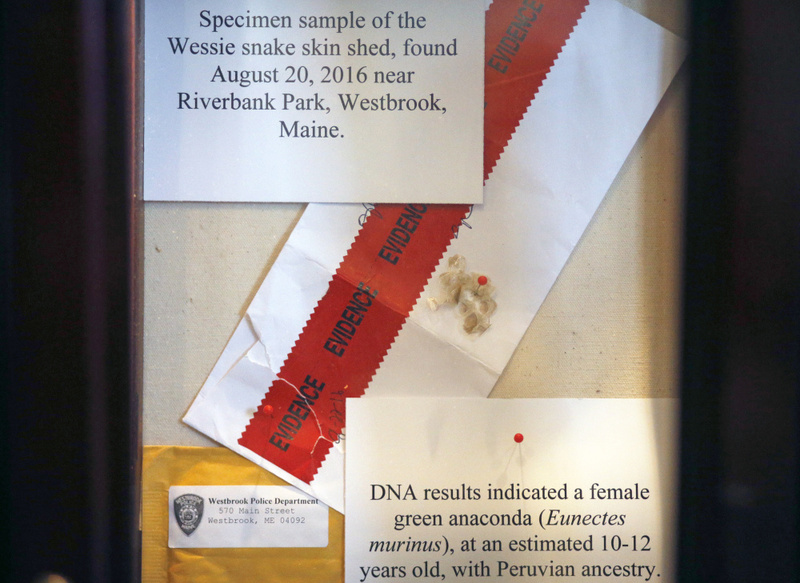 Loren Coleman, director of the International Cryptozoology Museum in Portland, agreed that the snake is likely dead and warned fans to be skeptical of reported sightings. Coleman did give credit to other theories, however. He recalled an alligator and her babies that survived an Illinois winter decades ago in a pond warmed by water from a nearby factory. “If we do have giant snake reports next year, there may have been a warm place where this snake spent the winter,” he said. 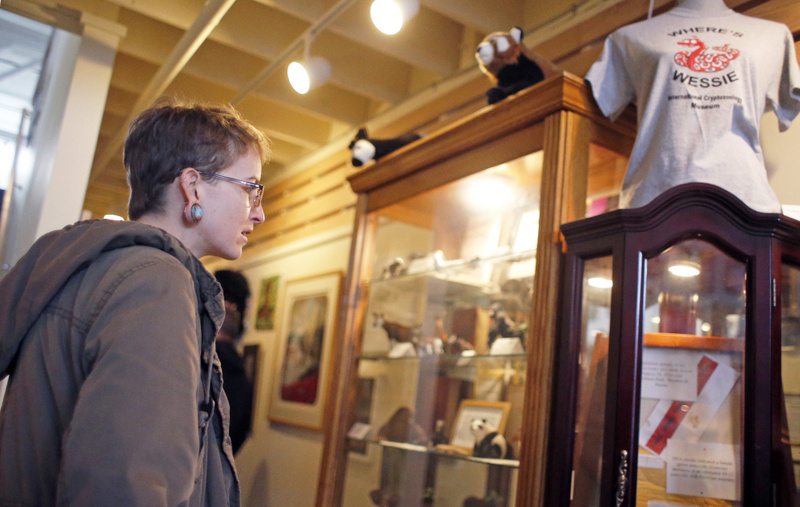 Either way, the International Cryptozoology Museum has become an outlet for Wessie seekers with no other leads. Cryptozoology is the study of creatures whose existence has not been scientifically proved, such as the Loch Ness monster. The cryptozoology museum’s Wessie exhibit. The museum still sells “Where’s Wessie” T-shirts and listed the story as No. 6 on its list of the top 10 cryptozoology stories of 2016. It currently includes a small piece of the found snakeskin in a display dedicated to Wessie, but Coleman said the city recently told him he will receive the entire skin for the exhibit. Westbrook has certainly adopted Wessie as its own. The city tried to capitalize on the craze by shooting a marketing video starring the snake. The Westbrook brewery Mast Landing released a limited edition of an IPA named for the snake, and the first batch sold out in three days. At the Downtown Westbrook Coalition, Cioffi helped organize Wessie Fest in honor of the celebrity snake. Despite rainy weather, Cioffi said the event drew more than 200 people. She said the organization hopes to host the festival again this year. “I think there are some options and some businesses that want to keep the story alive,” she said. And even if the snake is dead, an anonymous Twitter account in its name is still active. Since its creation in June, the Twitter handle called “Wessie P. Thon” has collected more than 1,800 online followers. Recent tweets from the account have responded to fans by claiming the snake is on vacation in warmer temperatures.